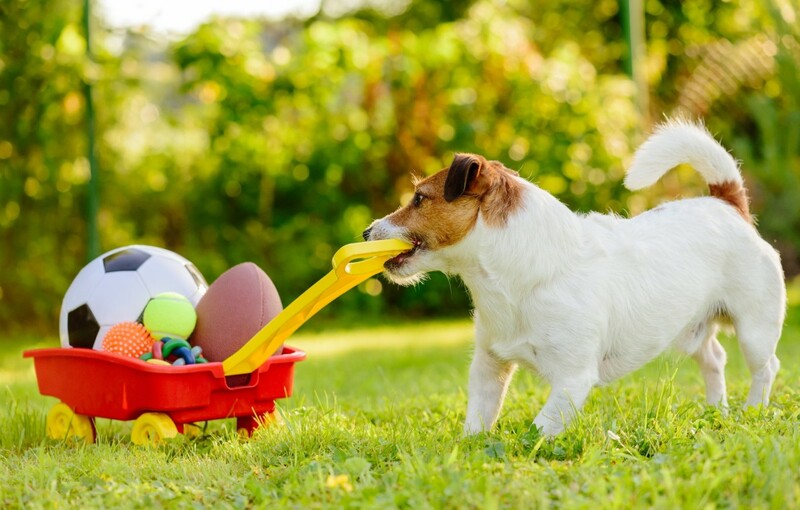 Dogs, like children, love to play with toys. They can also be picky about which ones they like and brutal with a favorite. 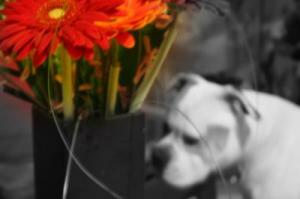 Buying your dog durable, safe, fun toys at the pet store can get quite expensive. This is a guide about saving money on dog toys. My poodle "Fluffy" (now passed on) taught me that she loved "babies". She found a dirty little teddy bear and would not part with it. I got it away from her when she went to sleep and washed and dried it and put it back in bed with her. After seeing she wouldn't get far away from that "baby", I started watching for new "babies" with no moving parts that could come loose or hurt her. I got them for 25 cents apiece at the end of the day at garage sales. After a couple of trips coming home with one on a Saturday, she knew which friend went with me. If we went out together, she'd wait for me and her new "baby". In the last few years of her life, she never hurt one of her babies. She would hide them here and there, but if a thunderstorm or other bad weather came, everyone of those babies was in her bed under her! Also if I brought her a new "baby" from the store, she'd ignore it! It had to have been pre-loved. Her favourite was a pink and purple elephant the same small size as her teddies. That day, the only thing I saw the right size was that elephant and I knew she'd be waiting. So that's my tip, look for toys that are sold at the end of the day, just a small one for a small dog. Probably not a good tip for big dogs. I now have a Shitzu cross and she takes her babies all over with her too! By Annie from Kitchener, B.C. 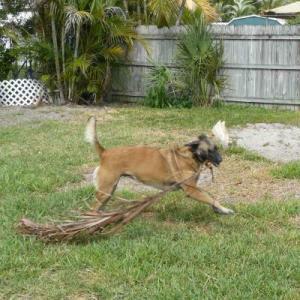 I have two very playful dogs and two energetic cats who love to play with toys. In the past, I found myself spending a lot of money on toys to only have then destroyed a few minutes after giving them to my girls. One day I noticed how whenever my niece would come over she was always missing her stuffed animals and we would always find it in someone's mouth! So I decided that children's toys were just as good for my girls as toys from the pet shop. I save money by going to the thrift store or yard sales and buying plush toys sometimes for as little as 50 cents. I get less upset when I see the toys destroyed because I didn't pay a lot for them; just be sure to throw the toys in the wash before giving them to your pet. Look for stuffed animals with stitching instead of buttons because they will pull those off first and may be a choking hazard. When you support your local thrift shop, you are not only saving money but helping your community so you can feel even better about saving money on your pet toys. I found the best toys for my little dog are the ones designed for infants. These are sturdy and they don't have little pieces that are easily detached. The local Walmart has end of season sales in their children's department and I found 3 different style squeaky toys for $1 each! The style I liked best is a cylinder about 4 inches long with an animal head on top. It's designed for a very small child to grasp and probably stick in their mouth so it's perfect for a dog that weighs less than 10 pounds! Source: Trial and error, most dog toys are bigger than my dog. 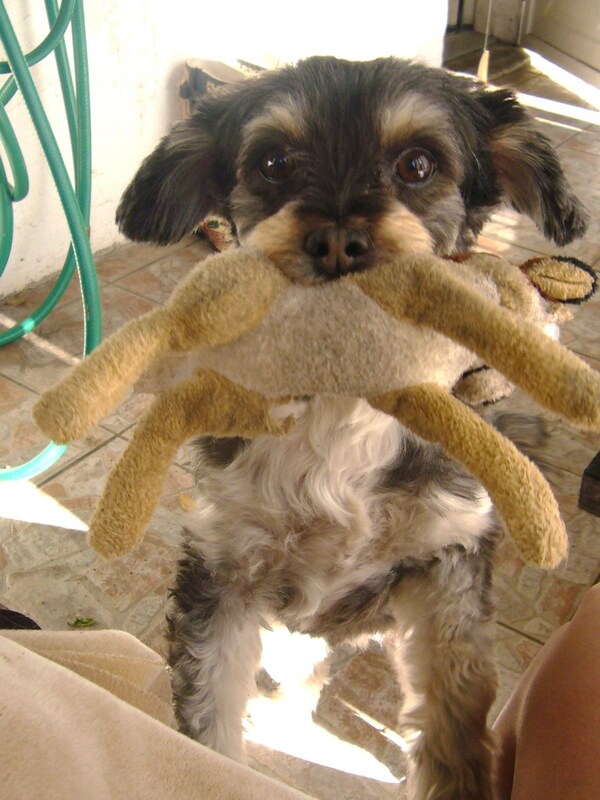 Pet supply chain stores offer some great stuffed toys for dogs, but so do thrift shops! Look to the stuffed toy section and find well made toys with sewn on material eyes. Keep a box in the closet or elsewhere for worn out socks and tee shirts, old pillowcases, and various other items that you can use to create homemade pet toys. Here's a few ideas to get you started. Any pet owner knows that making toys from worn out clothing or repurposing various items around the house is an inexpensive way to create some interesting dog toys. However, in some cases, that idea is not ideal. Dogs love stuffed animals to play with and sleep with. Problem is, they are expensive and the ones from the dollar stores fall apart easily. I volunteer for a rescue and I need ideas for dog and cat toys. Thanks. 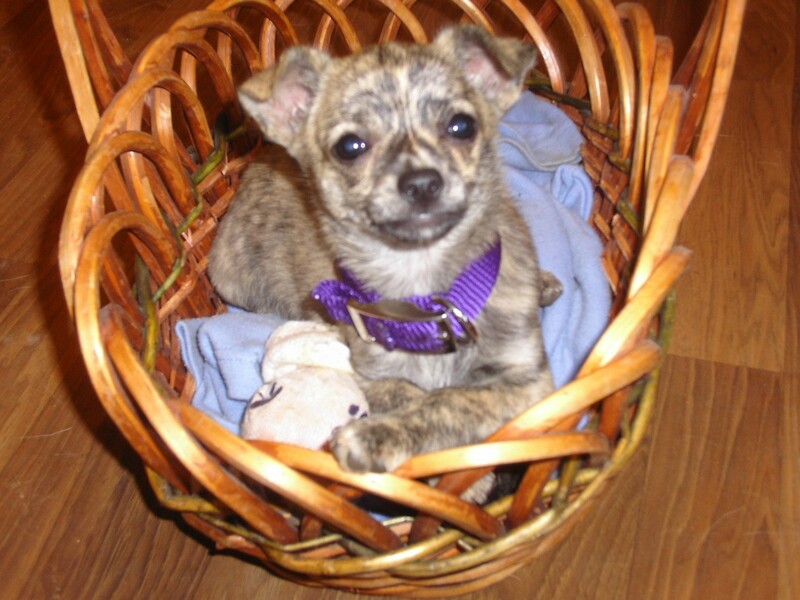 A modest cost and good cleaning by your own washer and dryer will bring your pet immense joy and satisfaction for you. My cats enjoy pouncing on and wrestling with a "spider". It is just a bunch of fleece strips about 1/2 inch wide and about 12 inches long tied together at the center 2-3 time. A fleece remnant would make a few inexpensively. When we first got our dog, she had no toys. I got a few old socks, tyed a couple together with thick knots and used them for everything from fetch toys to chews. Everyone has old socks with holes in them, so it's really a great way to recycle! Also, ask for a discount when you're buying for the rescue - never hurts to ask! My cat loves bottle caps from 2 liters. I work at an animal hospital and asked the vet if it was ok and he said yes. It's hard plastic so unlikely to fray or break. We also raid the local thrift stores for kids toys, they are usually made of the same material if not better and nothing a bit of soap and water can't handle. My cat used to play immediately with the milk cap whenever it hit the floor. The sound of it made her dart like a rocket where ever she was. Instant milk cap hockey. She also liked chasing a rope. My daughter used to run around the house with a rope dragging behind her and the cat pouncing right along. My daughter discovered that she can get stuffed animals CHEAP, CHEAP, CHEAP (usually $.99 for a medium sized toy) at Goodwill stores. We just make sure they aren't filled with beads, etc. and when we get them home, we remove the tags, plus any hard plastic parts. I usually wash them first, even though they look clean. Then we give them to the dogs and stand back and watch the fun. 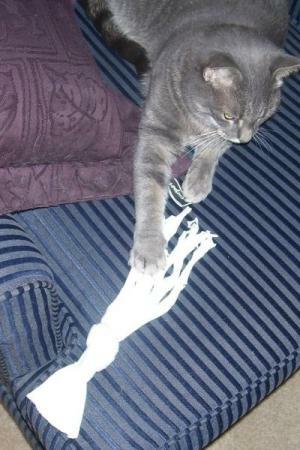 (Plus, it's always best to supervise your pets when they play with certain toys.) They have so much fun. We've been doing this for years! Our dogs love when they get new toys and I'm happy to spend 99 cents on something they'll destroy in a week or so. We've also picked them up at Yard Sales, too. Some good ideas here, but if you have a dog that is like a Tasmanian Devil and can disassemble a stuffed animal in five minutes or less, the used kids' stuffies may not be a good idea. Even with due vigilance ( taking off eyes, trim and making sure the fill is only polyfill-feel), a hard chewer can immediately tear into one of these and ingest enough fiberfill to either have a choking hazard or a digestive problem ranging from loose stools ( with strings of fill, lots of fun retrieving that!) to an intestinal blockage. I do the same. But, I go to yard sales, prices are anywhere from .10, .25, .50 and 1.00. I have volunteered for a rescue. I need ideas for dog and cat toys, etc. 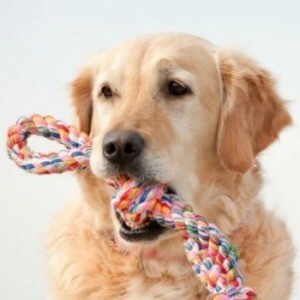 Knotted-up socks are fun chew toys for dogs and a great way to use the ones that always seem to be without a mate. A tennis ball in the toe of an old sock, so when you throw it, the "tail" kind of wiggles like a squirrel. For little puppies these are also easy to catch. My neighbors swear by a few pebbles in a plastic water bottle (depending on the size of the dog-they have all sizes and use all sizes of water bottles) she throws it for her 4 dogs, and they love it, it crinkles when they pick it up, and the stones rattle when they shake it.